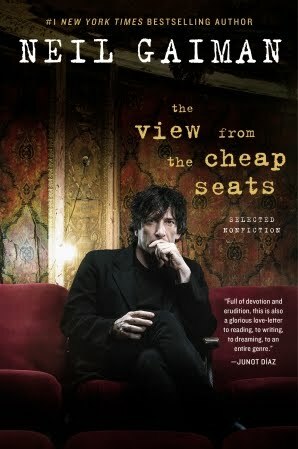 I was very lucky and got an early review copy of Neil Gaiman's collection of selected nonfiction, The View From the Cheap Seats, which is out today. I always enjoy Neil's introductions and essays and am glad to have many of them in one place now. And though I've read some of the speeches and introductions before, I am finding that sitting and reading them as a collection is helping me really appreciate what a brilliant and thoughtful man he is, how he uses his words to present big ideas in ways that all readers and listeners can understand, and how invested he is in the entire world of books, stories, authors, and readers. This book contains speeches, essays and introductions. Some of the introductions made it into this volume because I love the author or the book in question, and I hope my love will be contagious. Others are here because, somewhere in that introduction, I did my best to explain something that I believe to be true, something that might even be important. The fact that this is an introduction to a group of introductions just struck me as funny. 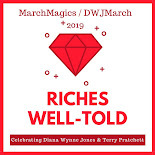 Anyway ... if you haven't yet tried Diana Wynne Jones or Terry Pratchett or Douglas Adams, Neil's kind and adoring words about them might get you interested in finally picking up one of their books. And if you weren't already familiar with the art of Dave McKean, you'll probably find yourself curious enough to start Googling. And if you've never thought about the definition of genre, you just might find yourself discussing it with your hubby at 2am when you should be sleeping (this one could just be me). 3. Reread. It's better the second time. It will be even better the third time. And anyway, the books will subtly reshape themselves while you are away from them. So, while The Art of Neil Gaiman is about everything that Neil has produced, this book is about many of the things that have gone into his lovely brain over the years and steeped and become those very things that we have already enjoyed about him and his work. It is a sampling of the essence of Neil Gaiman and it can't help but make fans even more ardent. I'd like to claim that I had already formulated Jenny's Law in 2002, but that would be a lie frankly. In 2002 I was still figuring out that some of the DWJ books I'd tried and hated were actually super awesome if I gave them another go. But it's weirdly validating to know that there are other authors who are like this (in general) and that Gene Wolfe is one of them, because I have tried a couple of his books before and not loved them and wondered if he was just Not for Me. It does make me wonder if there are any other authors that I should give a second read to. And it means that when I finally try Gene Wolfe, I'll keep in mind that he might need a second read. Maybe we need a list of "better on second read" authors? I love Neil Gaiman, so I'll definitely be checking this one out. Thanks for the thoughtful review! This looks amazing! I haven't read any of his nonfiction aside from the introductions to his short story collections, but Neil Gaiman is the man, and I'm sure his nonfiction rocks. It really does. He writes like he talks. You know it's him and so this is like a giant book of one-sided conversations. You are so lucky! I thought this was arriving today but it didn't. :( I am looking forward to it!